A woman should never be seen eating or drinking, unless it be crayfish (lobster) salad and Champagne, the only true feminine and becoming viands. Crayfish is a freshwater variant of the lobster. Have six appetizer plates ready. In a small bowl, combine a pinch of sea salt, pepper, the cumin, the zest and juice of 1 lime, ginger, coriander and olive oil, and whisk to emulsify. With a sharp serrated knife, peel the skin and pith from the grapefruit. Cut the fruit into segments, discarding the membrane. Dice finely and set side. Dice the lobster meat finely. 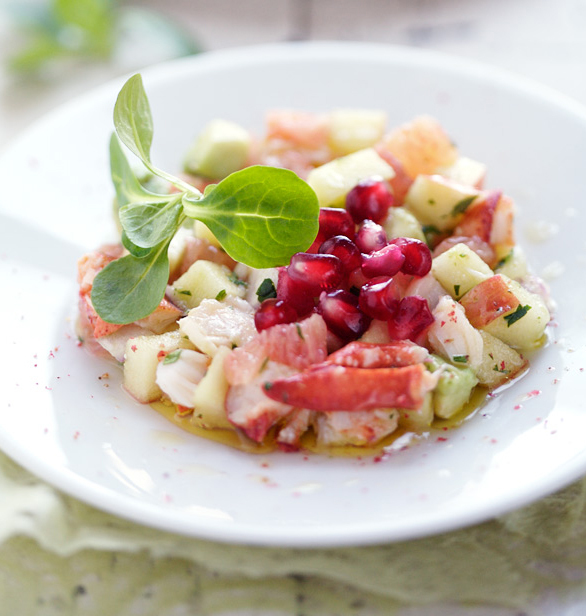 In a large bowl, gently toss the crayfish meat, cucumber, apple, grapefruit, avocado and 2 tablespoons of red onion. Drizzle with the dressing and toss again. Place the ring mold on top of one plate. Pack 1/6 of the fish preparation into the mold and remove the ring. Repeat with the other five plates. Top with chopped red onion and pomegranate seeds. Drizzle with olive oil and decorate with watercress leaves. Serve immediately. “Things that excite me, be they pastry, or crayfish (lobster), or love…” Jimmy Buffett. This entry was posted on October 26, 2010 at 3:08 pm and is filed under Cooking, Family, Friends, Random, Recipe. You can follow any responses to this entry through the RSS 2.0 feed. You can leave a response, or trackback from your own site. miss your food post a lot.